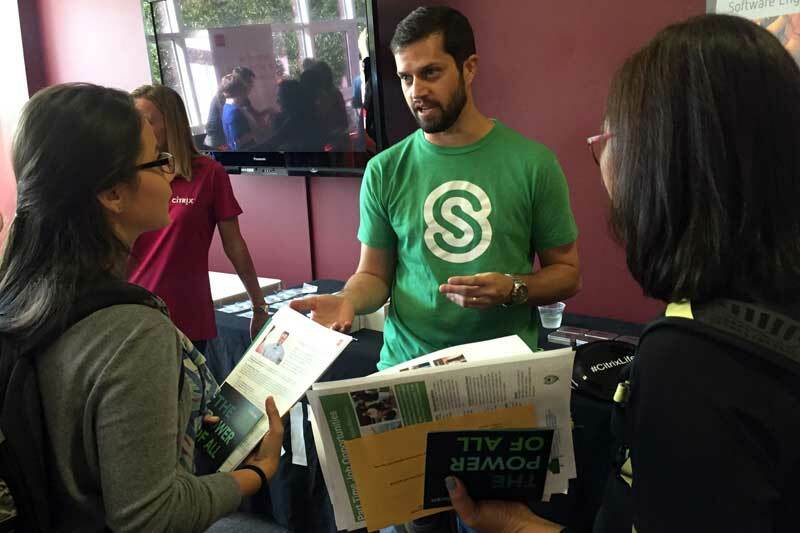 The Meredith College Office of Career Planning hosted the second annual Internship Discovery Expo on September 15 at the Cate Student Center. An estimated 170 students attended the event for the opportunity to speak to employers from around the Triangle in a casual and relaxed atmosphere. SAS, Citrix, and Credit Suisse were among the 24 businesses stationed at tables throughout the Cate Student Center. According to Jane Matthews, assistant director of employer relations in the Office of Career Planning, the attendance of students and employers increased from the previous year, as did the variety of employers in attendance. “Participating employers represent a wide variety of industries, including non-profit, finance, and IT,” said Matthews. Fareena Qamar, ’20, a university recruiting intern for SAS, was doing just that. Qamar found her position at SAS earlier this year through the Office of Career Planning. As a recruiter at the Internship Discovery Expo, she was impressed by the confidence of Meredith students. “Approaching our booth with a friendly smile, being genuine and passionate about what they want to do — those are the first steps to landing an internship,” said Qamar. Lawrence and Qamar were not the only recruiters impressed by Meredith students. Emily Maiers, project manager at GlaxoSmithKline Pharmaceuticals (GSK), was pleased by the turnout. “I appreciate the eagerness these women have for finding something that is the right fit for them,” Maiers said. Bianca Villanova, community engagement coordinator for Marbles Kids Museum, was also happy to meet with students who fit the culture at the museum. “Meredith students are curious, open, and always interested in learning more,” Villanova said.